Remember that our Thanksgiving Feast is on Thursday, November 15th at 11:30. We will read poems and enjoy the yummy food. * Language Arts Unit 2 - Week 4: We live in different kinds of homes with our families. - Thanksgiving Feast Sign Up! Please go to the WIKI to sign up for our feast on November 15th at 11:30. 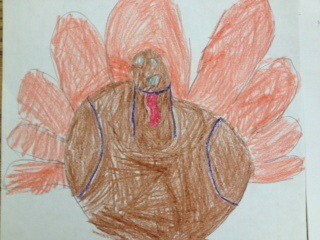 -Thank you Ricky for the beautiful drawing of the turkey. *See picture above. -Kinder, First grade and Second grade were each given 5 Ipads! Thanks PTO! - WOW, Cameron has loged on to Dreambox for 36 hours!!! Way to go!! -I tried to take on the new Gold Medal Reading program and failed. SSF has a new way to record books on the computer instead of turning in Blue Sheets and I was very resistant to it but after logging on hundreds of hours decided I need to go with the new system. So, starting now, I need you to record all the books that your child reads and the books that you read to them onto the Gold Medal Reading site. 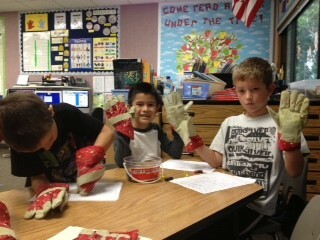 It is very easy for a parent to do and I will be sending home the detailed directions on Monday. -Thank you to Julie Prior who used the class fund to purchased 24 pencil grips and a bunch of fidgets! -We have had a Hokki Chair on loan from Ms. Karen and many students have been wanting to use one too. It’s a special chair that wiggles and helps children focus. It’s very beneficial to those who struggle with staying in their chair. They are very pricy but I’ve heard that Amazon has the best price. (The 18 inch works well for most first graders). I’m very open if you would like to purchase one on your own and have your child use it in our classroom. -Thank you to Ms. Blate for teaching us about ability awareness. We learned about differences, similarities and talked about autism. We tried to color in tiny shapes while wearing huge gloves to see how difficult it would be to have very poor fine motor. Then tried to set a table listening to “fake” language. It was very hard to understand until Ms. Blate showed pictures where each object needs to go. Thanks for opening our eyes and help us understand others! 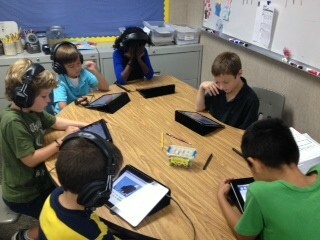 Reading books on our IPads! 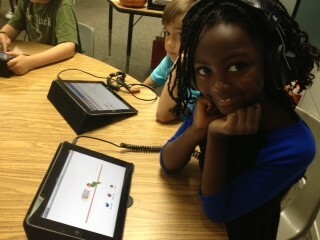 Thanks PTO for buying 5 IPads for 1st Grade! Trying to color with big gloves on.